The in-bin is overflowing with so much info this week that I didn't have enough time to get it all in. I have plenty to carry over to next Friday's post. On Tuesday, I reviewed South Street's The QUICK FIXX, which served us some excellent gluten-free pasta dishes at a recent meal there. 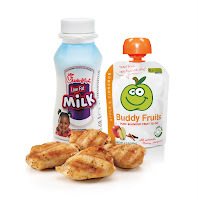 The biggest news of the week is word that fast-fooder Chick-fil-A has added gluten-free grilled chicken nuggets to its kids' menu, although adults certainly can order them as well. The four count is 80 calories and 1 gram of fat, while the six count contains 110 calories and 1.5 grams of fat. The chain is enhancing its side choices as well, adding Buddy Fruits applesauce - also gluten free - as a complement to the fruit-cup option. Although not as healthy a side, the waffle fries are also safe, as they're prepared in dedicated fryers. About 90 percent of the menu at the new Hickory Lane Bistro in Philadelphia's Fairmount section (2025 Fairmount Ave., 215-769-2420) is gluten free, according to general manager Jack Anderson, and the other items can be modified accordingly. The chef there, Matt Zagorski, was GREAT-trained when he worked at Rouge. Thanks to reader Marcella P. for the restaurant tip. Lunch café Buds & Bowls at the Lawrenceville Inn (2691 Main St., 609-896-0569) serves a variety of gluten-free soups, quiche, salads, sandwiches, burgers and desserts. In Feasterville, Toscana 52 (4603 Street Rd., 215-942-7770) has gluten-free pasta available (prepared separately) and can modify entrees that otherwise call for flour. Seasons 52 Fresh Grill's two local outlets at the malls in King of Prussia (160 N. Gulph Rd., 610-992-1152) and Cherry Hill (2000 Route 38, 856-665-1052) have set their Winter 2012 gluten-free menu. Tutto Fresco in Wilmington (514 Wilmington Pike, 302-762-9094) is the new name of the former Lamberti's Italian Grill & Bar at that location. The restaurant serves gluten-free pasta. Reader Rich S. dropped me a note about YogoMix, a fledgling fro-yo business with spots in Yardley (15 S. Main St., 215-369-YOGO) and Lawrenceville (3257 Quakerbridge Rd., 609-587-YOGO). All flavors except those with cookies are gluten free. The official second anniversary is Sunday, January 15, but the ladies of Sweet Freedom Bakery (1424 South St., 215-545-1899) will be celebrating Saturday and Sunday. On Saturday, they'll be raffling off prizes such as Sweet Freedom gift cards, T-shirts and cookie cakes as well as gift cards from other local businesses. On Sunday, customers can enjoy a free treat while supplies last, plus they'll be offering an in-store "twofer" day, with two items for the price of one (one per customer and excludes some items). I was saddened to learn this week that Food for All Market in Mt. Airy (7127 Germantown Ave., 267-297-7122) plans to close. The store will remain open until all of the stock and equipment are sold. All grocery items are being sold for 20 percent off. 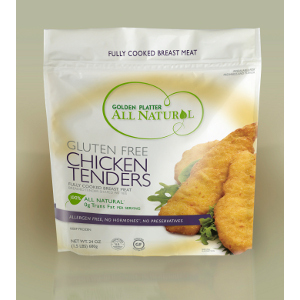 New fully-cooked gluten-free chicken tenders and nuggets from Golden Platter are on sale this month at Acme markets. Feel Good Foods' new gluten-free egg rolls are now available at Whole Foods in Marlton (940 Route 73 N., 856-7997-1115), according to a company tweet. If you love cars, consider going to the Philly Auto Show's Black Tie Tailgate on Friday, January 27. Proceeds benefit CHOP's Division of Gastroenterology and the food will be catered by Stephen Starr Events. Check out the gluten-free options listed on the menu, including a milkshake bar at the dessert station! ‎The National Foundation for Celiac Awareness is working with St. John’s University College of Pharmacy and Allied Health Professions to study the effect on people who follow a gluten-free diet if they take medicine that contains gluten. The U.S. Food and Drug Administration is funding this research study. The study has two parts. First, the NFCA will conduct this survey, and then will test some medicines to see if they contain gluten. The results of this survey will help them learn more about people’s experiences, and will help them decide which medicines to be tested for gluten. Together these findings could help the medical and scientific communities see that more research and investigation are needed. This survey will take between four and 15 minutes to complete, depending on your responses. It closes on February 28. Jovial Foods has organized a gluten-free getaway in Lucca, Italy from May 27 to June 2. Twenty-five percent of the proceeds from room sales will go to the NFCA. And if all of that is not enough for you, I'm thrilled to be talking baseball again. The Phillies game on Friday, July 20 against the San Francisco Giants will be Celiac Awareness Night. I'll pass along ticket information as it becomes available. Hey, pitchers and catchers report in just five weeks!